Our Asian Chicken and Roasted Pepper Sandwiches last week called for an asian inspired salad. I had a fresh head of cabbage from my recent Farm Fresh to You delivery. More on that in a future post. I have never made this particular recipe using fresh cabbage before. I always used the bag o cabbage because that's what my step mom who shared this recipe with me uses. But the fresh cabbage was excellent and took the slaw up a notch! I would have also liked some fresh carrots to shred into the mix but cabbage did fine all by itself. My step mom has been making this salad/slaw for a number of years and so have I. She got the recipe from her sister. I am not sure where her sister got the recipe so I don't know who to credit for this. But kudos to whoever came up with it! Asian Slaw is a great dish to bring to a pot luck, BBQ or summer bash. This crowd pleasing dish holds up well as far as a salad goes because of the sturdy cabbage. Even when its dressed, it fares well during a party. It's one of those dishes that people request the recipe for. And Hubby likes it so it's a win win in my book! Place uncooked ramen in a ziploc bag and crush into small pieces using a meat mallet or rolling pin. Place crushed ramen, sesame seeds and almonds on a baking sheet. Toast in a 350 degree oven for 10 minutes until lightly golden. Toss slaw, green onions, ramen, sesame seeds, almonds in dressing. 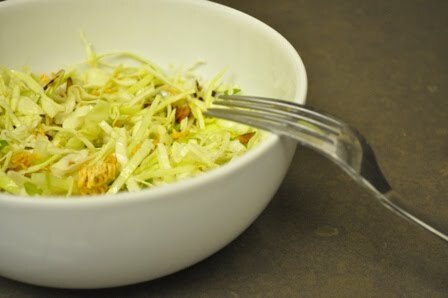 Let the salad sit for about 10 minutes before serving to allow dressing to soften the cabbage a bit.